I wonder if anyone remembers the Carousel’s Singles Club that used to be held in what is now the Unemployed Centre in Tilbury Place? My first visit was in early 1980, but unfortunately I do not remember when the club opened. It was a strictly members only club and the membership fee was £15. You paid your fee and then you had to wait a week before you could use the club, those were the rules in those days I think. Anyway, having got your membership card, you had to sign in every time you visited. The lady who ran the club had very strict rules and regulations about what was acceptable and what was not. In fact she was the person who sat by the door, checking your membership card and getting you to sign in. The club was open seven days a week from about six or seven o’clock till 10.30pm. It was very quiet most nights except for Thursdays when there was a disco. They had a resident DJ – I think his name was Steve. Occasionally the club had ‘special’ nights. I particularly remember a Halloween night when everyone went in fancy dress. I went as a wizard and my friend Alison was dressed as a cat. Alison and I were engaged in 1981 and married in 1982. We did go back several years later to find out if the club was still open, but it had closed. I wonder if anyone else went to the Carousel’s Singles Club? Maybe you can remember more about it than me? If you can share your memories, please leave a comment below. I used the Carousel from 1979 until 1983. The owner was a lady named Phyllis Bush. She sold out to a Mr. Michael Fry. I remember the Saturday discos. Every fortnight they would have an extension until midnight (bars were only licensed to 11 pm). I had some good times. But like most things it came to an end. I think it closed in 1984. But I have some great memories! Wasn’t this the site of Brighton Girls’ Club? A wonderful club run by Miss Prior and her father. When we left we were always asked to be very quiet as the Tarner Nursing Home was almost next door. I used to help my friend Neil set up the set for the DJ King Gerry back in 82/83….. good times. Message to Iris Gilman: Yes, it was the Brighton Girls’ Club, I think it was up to the mid 60’s. I met my 2nd husband here in 1979. My friend and I, being divorced mums, found money tight so bought one membership and signed the other in as a guest. I really enjoyed it there. I remember upstairs a bar, pool and darts. Downstairs was a bar and dancing. Remember it? Oh yes! My mum was Phyllis Bush. We lived there for the first year or so, before she had a live-in caretaker (Vic) – I was about 16. The club was really successful and I remember it being busy most nights of the week. Mum eventually sold the club and I believe it closed a year or so later. There was a restaurant/bar upstairs, pool room, TV room and, of course, the ball room on the ground floor, where the discos were held (with large bar). Mum used to arrange holidays as well, and day trips. Lots of friendships/marriages formed from the club. The club had started in rooms at pubs but was so successful Mum opened up in Tilbury Place. Sadly Mum passed away in 2011. She led an extraordinary and full life, to the end. My husband and I met at the club back in 1981. We have some wonderful happy memories. We have been very happily married for 33 years. Our names were Ted Barnes and Pam Hall. I remember you Myra, and your mother Phyllis. You once predicted my future by tarot cards, when the club was located at the Sussex Pub near Osborne Villas in Hove. 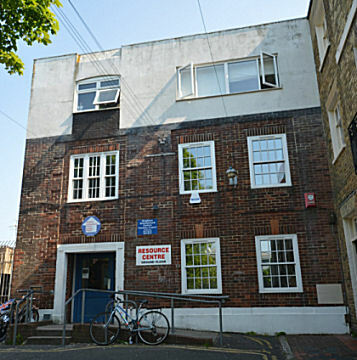 The club moved to Tilbury Place in 1979 and was for a time very successful. The DJ mentioned above was Steve Horlock, who was very good. The club suffered a slow decline and by 1982 it was clear that numbers were down. Phyllis tried an amalgamation of members with CB radio enthusiasts, but this did not seem to go down well. She sold the club in the spring of 1982, but the new owner was not very successful in reviving the club. It ended about a year later. Hi Brian. I don’t think that was me telling fortunes. You may be getting me mixed up with Izzie (Steve Horlock’s then girlfriend) who used to tell fortunes, I believe. I hope you had good fortunes, in reality! I used to work at the club (after school/college) either on reception or, once I was 18, behind the bar. I also used to do table service – Mum had me dressed up as Mother Christmas and the like – oh the embarrassment! It is so wonderful to hear of the people who found happiness at the club – Mum would have been thrilled as that was her main motivation. I remember you, Izzy, as well as Myra. You and Steve were the best DJs the club had and you played a lot of disco music from that period. Although you were a fortune teller, it was definitely Myra, who predicted my future. It was early in 1978, when the club was at the Sussex Hotel in Hove. Phyllis used to hold games evenings and it was on one such occasion that Myra (who was probably about 14 at the time) predicted my future.